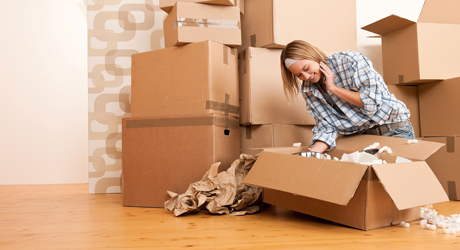 Whether you are moving into your first home, changing address or wish to close your account, please advise us as soon as you can, but at least five working days before you move will ensure that we can complete everything for you. You can advise us of your move online or call us. How do I change my address with you? To notify us of a change of address please complete this form or call our Customer Services Department at least five working days before you move. How do I set up an account as a new customer? To set up an account as a new customer, please complete this form or advise the Customer Services Department at least five working days before you move into your new home. If you are closing your account please use this moving home form or contact the Customer Services Department giving at least five working days notice. The special instructions box can be used to advise that you wish to close your account, we can email your final bill to you. My new property has been disconnected, what do I do? If your water supply in your new property has been disconnected, you will need to apply for a new account or notify our Customer Services Department at least five working days before you wish to move in. What do I do about the property I am vacating? You are responsible for the cost of the water supply at your exsisting property until you notify us that you are moving out of the property, so please complete the moving home form or advise our Customer Services Department once you have moving dates confirmed. If you require any further information please contact the Customer Services Department.